This half day workshop from 1:00 - 4:00 provides an overview of cold-process soap making geared to beginning soapmakers and those who would like to make soap for the first time. 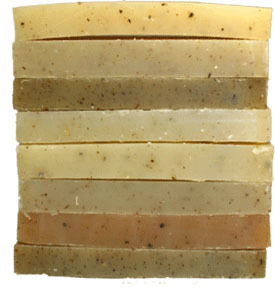 If you are also interested in learning the various options involved in cutting, drying/curing, and packaging soap, consider our one day beginning workshop. The workshop fee includes class lecture, demonstration, beverages and snacks; all supplies and materials needed for class (oils, butters, lye, fragrances, safety goggles, gloves, aprons, and soap mold to take your soap home) and the Workshop Workbook including classroom lecture notes, helpful online resources, and recommended soap making suppliers. The half day workshop is over about 4:00 pm. We will provide all Supplies and Materials you need for the workshop, including safety goggles, gloves, aprons and molds. Please wear old clothes so if you splatter olive oil or butters on them, you won’t be heartbroken. Long sleeves, full length pants and closed toed shoes protect your skin best so please wear them. Register for this Workshop by putting it in your shopping cart and checking out. You may also pay by check or money order in the amount of $85.00 and mailing it to The Soap Shed, 179 Meadow View Road, Spruce Pine, NC 28777. Should you need to cancel your attendance - for any reason - please let us know as soon as possible. If we can fill your space prior to 7 days before the workshop, you will receive a refund of your payment minus a $25 non-refundable deposit. If we cannot fill your space at that point, you will receive half of your original payment in the form of a refund check.